The library is getting a telescope to lend to the Durham community! Come learn about our new telescope and what to look for in the spring sky. 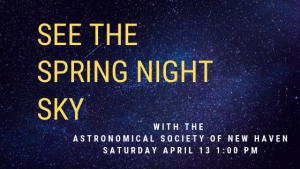 Members of the Astronomical Society of New Haven (ASNH) will be here to present a tutorial on the Orion StarBlast 4.5″ Astro Reflector Telescope with a visual presentation of what to look for in our night sky in the coming spring months.